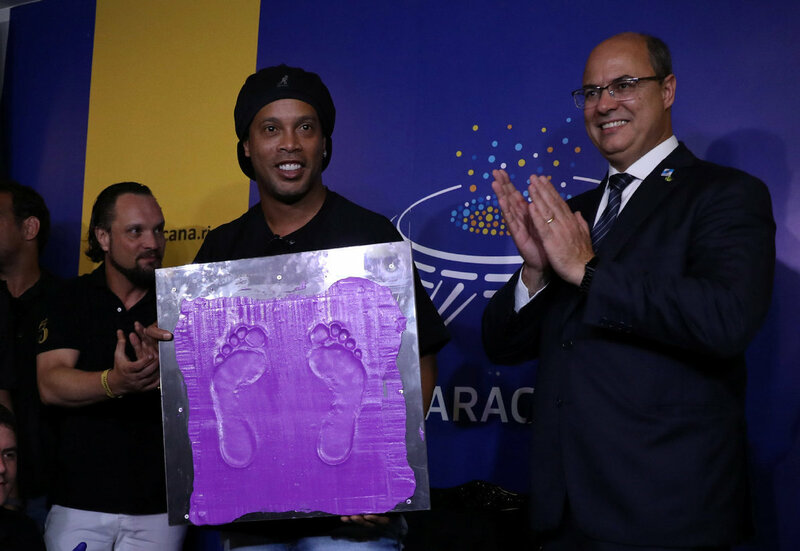 Brazilian legend, Ronaldinho, has been inducted into the hall of fame of Rio de Janeiro’s famous Maracana Stadium. The 38-year-old two-time Ballon d’ or winner (2004, 2005) was given the honour on Tuesday. He joined Pele, Garrincha, Zico and other Brazilian greats who also have footprints in the stadium’s hall of fame. The tribute comes during troubled times for the Brazilian, who had his passport seized by police in November. The decision is related to a $2.5 million (£1.96m) debt. Ronaldinho was a member of the Brazilian squad that won the 2002 FIFA World Cup co-hosted by South Korea and Japan. He also helped Barcelona win the 2006 UEFA Champions League.